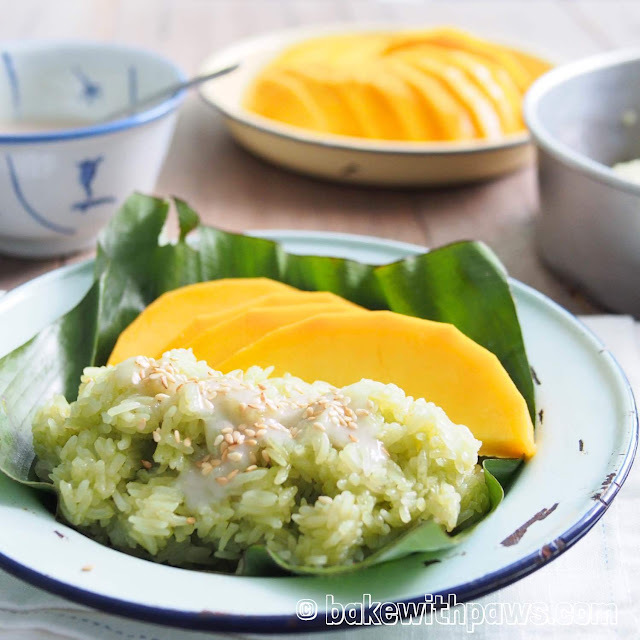 There is something about the combination of mango and sticky rice that we never get tired of. This time I thought I could add one more element that I love and that is - Pandan! I added Pandan to the stcky rice and when combined with the coconut cream it produces an intoxicating fragrant match that perfectly complements with mango. ]If you have any questions regarding this recipe or any other post, please leave me a comment in the “LEAVE A COMMENT” link and I will reply you as soon as possible. Wash the glutinous rice and sock with enough water overnight or 8 hours. The next day, drain the rice. Prepare the steamer. Line the steaming tray with banana leave and lightly grease with oil. Place pandan leave in the tray. Place the rice into the lined steaming tray and steam over high heat for 20 minutes. 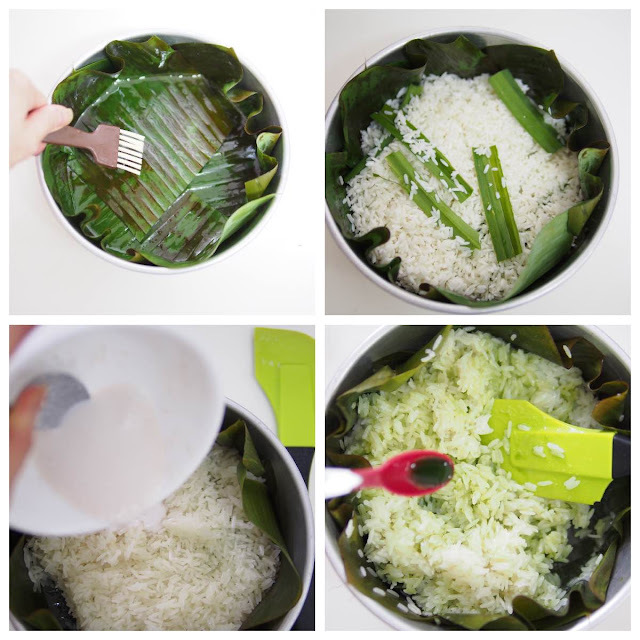 Remove from steamer and discharge the pandan leaves. Add in 90g of oconut milk and pandan juice, stir well. Return to steamer and steam for another 10 to 15 minutes. In a saucepan, combine all the coconut cream ingredients and bring to boil over low heat. Discharge pandan leaves and transfer to a gravy bowl. Peel the mangoes and cut into the desired size. 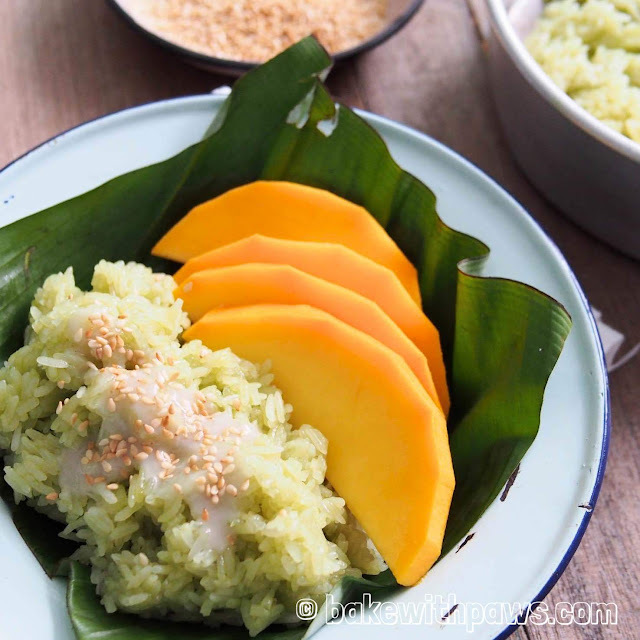 Scoop some pandan sticky rice on a serving plate, place mango slices along rice, drizzle some coconut cream and sprinkle some sesame seeds on top of the rice.